A confidential report, paid for by the world’s renowned Copenhagen-based shipping giant Maersk, and prepared by one of the most respected consultancies in the shipping industry, Litehauz, has reportedly listed the heavy metals and hazardous chemicals that the ships leak and which can be measured in the environment around the Alang shipbreaking yard in Gujarat. “The tide in Alang is a massive 13 metres and, as it rises, it picks up oil, chemicals and wastewater that are exposed to the environment when the bulkhead and pipes are partitioned”, the report says. “The effort to develop and implement a feasible technology is estimated to be 1-3 years and considerably more than 100 000 euro,” it adds. Comments Danwatch, making the confidential report as the basis of its recent opposition to Maersk Georgia and Maersk Wyoming, currently lying on Alang shipyard for dismantling, these are “twice that size.” It contends, the two ships were sent to Alang because the profits of Maersk had begun to plunge. 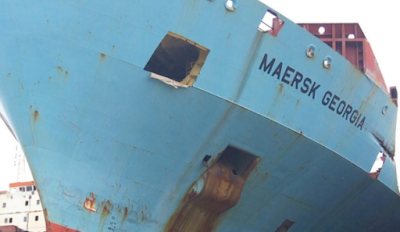 “But Maersk had already taken steps to help offset the disappointing result. At the bottom of page 15 in their newly-released Sustainability Report for 2015, the company explains that it expects to save 150 million US dollars by disposing of their decommissioned ships at a shipbreaking yard on a beach in India”, it adds.